Like us on Facebook – you’ll get notified as soon as a new solution is available. Need a clue explained? Post a comment below and we’ll reply promptly. The first time you leave a comment on this site, it will not appear until it has been approved. This entry was posted in Observer Everyman Cryptic Crossword Solutions and tagged answer, crossword, cryptic, everyman, observer, solution on August 26, 2018 by pavlov.a. 1 down, has to be Boulevard. I get Boulez, but where did the “Z” go, and what’s “DRAV” about? 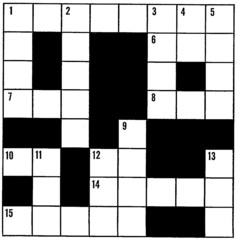 your query seems to relate to a different crossword from the one I’ve published the solution for here. The Observer Everyman crossword is syndicated in many different publications at different times. But if you can reply to this with the full wording of the clue I’m sure we can help explain the answer! The composer is not BOULEZ but RAVEL. ‘Upper-class’ is U, and ‘person in the street’ is BOD. Put RAVEL+U upside-down (turned up) in BOD gives BOULEVARD. Thank you! I’ve made this mistake before – confident that I have solved part of the clue I can’t make the rest fit. I should have started again from scratch. It was very good of you to take the trouble.